Recently, I gave a Kristine ID Wallet as a gift to a young lady for a high school graduation gift. I wanted to wrap it in some pretty wrapping paper, but I didn't have a box that was a good size for holding the wallet along with the matching wrist strap and lanyard. 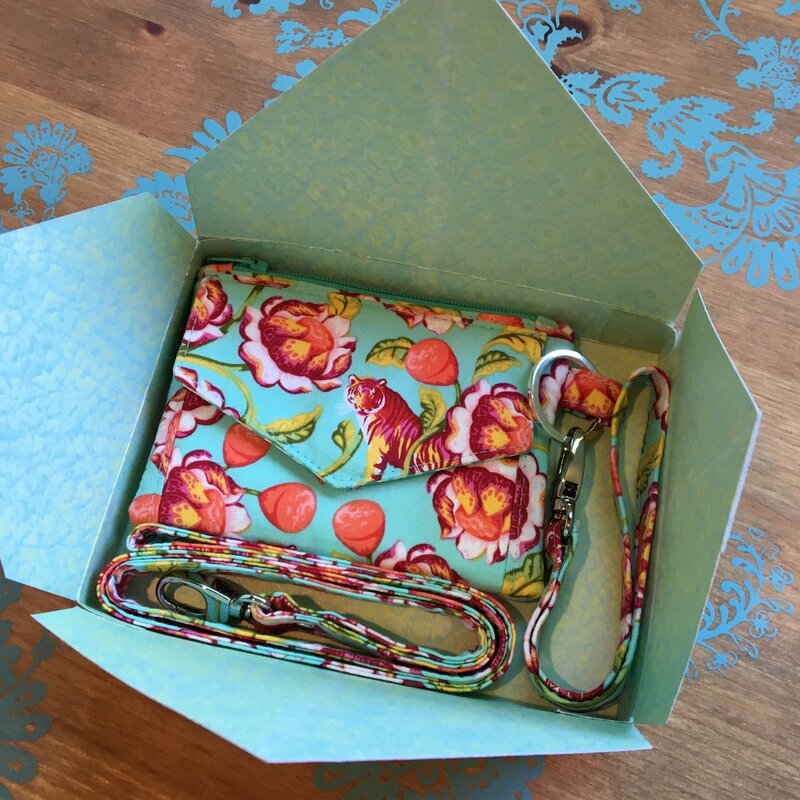 I remembered making a gift box once for a Necessary Clutch Wallet and decided to work out a custom gift box to fit a Kristine ID Wallet with enough space to also fit a wristlet strap or a lanyard or both. By the way, if you don't have the Kristine ID Wallet pattern, I have links where you can purchase the Kristine ID Wallet pattern at the end of this post. The Kristine ID Wallet makes a great high school graduation gift, but it is also a perfect gift for any teenage girl or girl in her early twenties. Nurses and medical staff also like the Kristine ID Wallet with the lanyard option for holding their badge and other necessities. Teachers and other's who wear an access or security badge daily, love this wallet. It is also great for a quick trip to the grocery store, holding just what you need while leaving you hands-free to shop. I have given several Kristine ID Wallets as gifts and they are always well received. Now to add an even more personal touch - let's make a gift box to hold your fabulous Kristine ID Wallet creation! 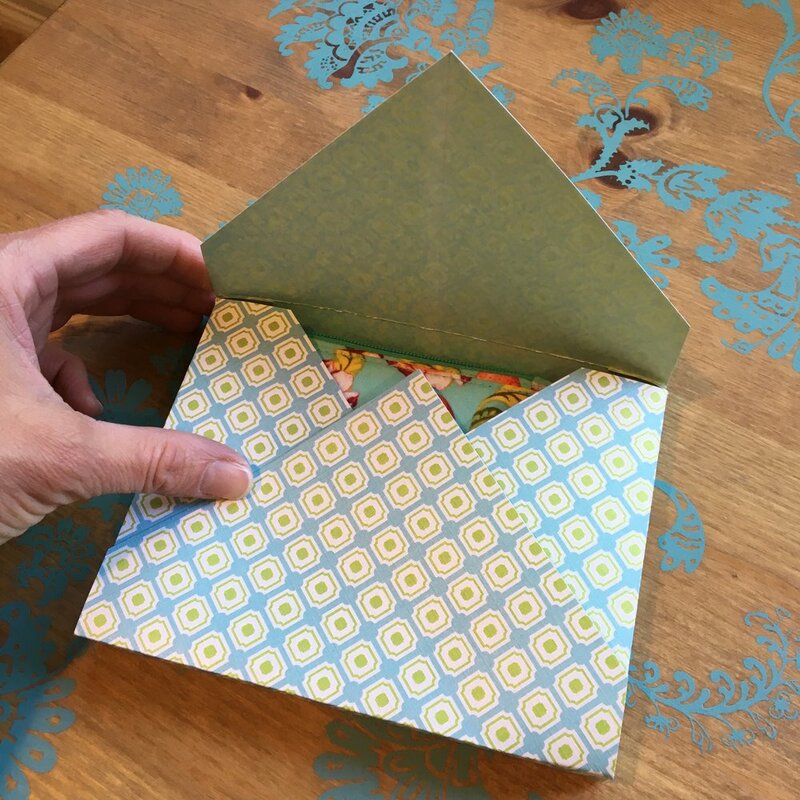 I like the card stock that has a coordinating pattern on the opposite side so that the box looks pretty inside and out, but of course this is not necessary. 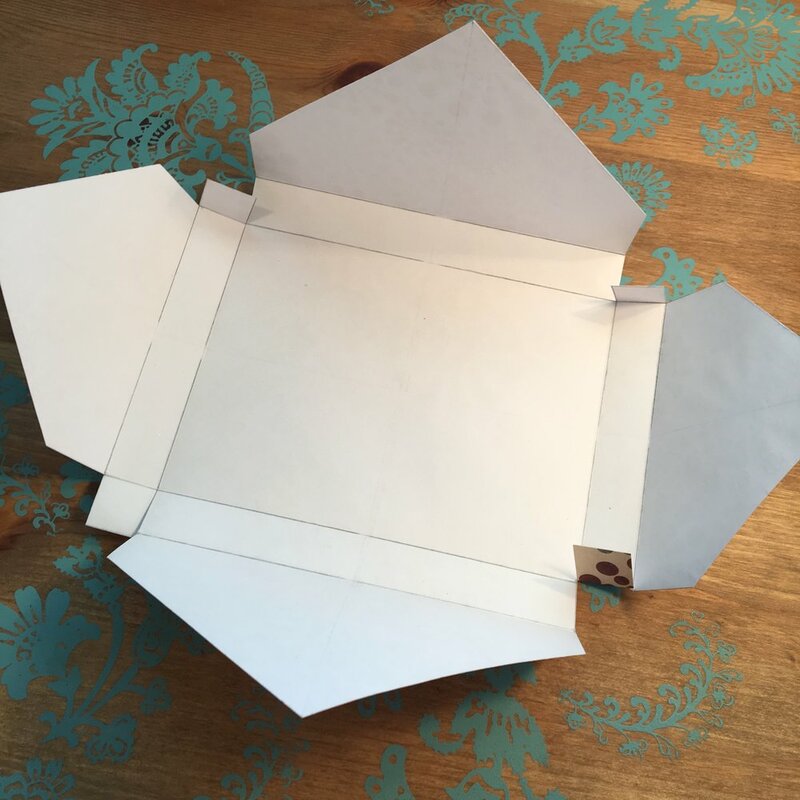 Using card stock with printing on both sides can make it more difficult to see your fold lines that you will be marking - a bit of a drawback and therefore something to consider. 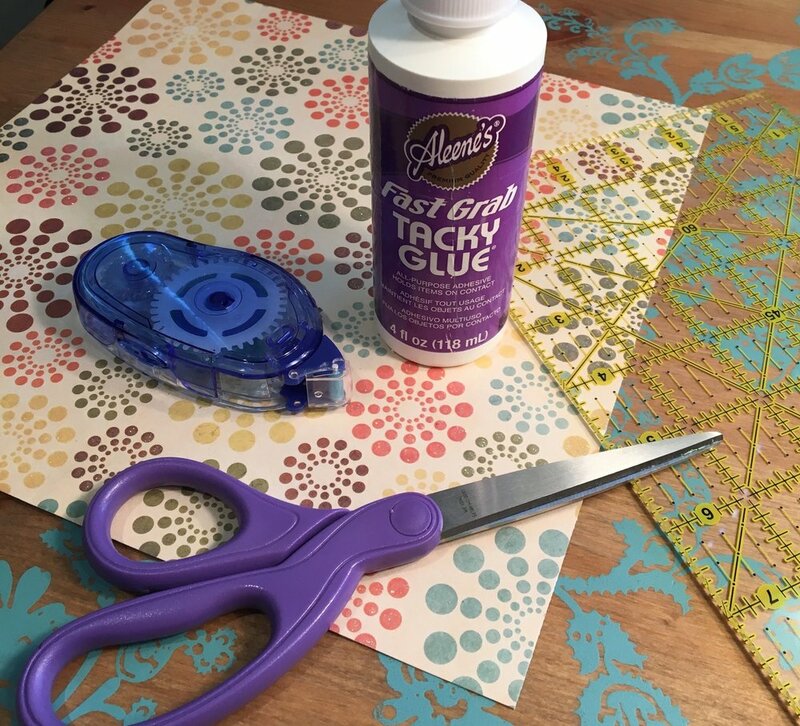 You will need to cut a 12" square piece of card stock down to a 10" square first. Once you have done this, place your card stock piece wrong side up and make a light pencil line from one corner to the opposite corner. Repeat this, making another line from one of the other corners to the opposite corner from it. 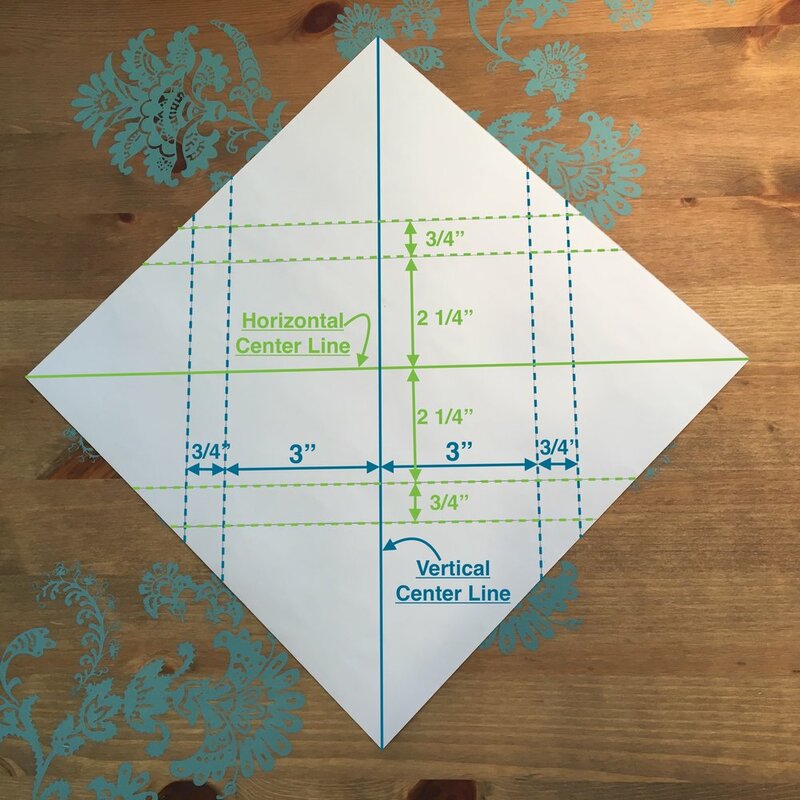 These are your center lines that you will use to measure all your other cut and fold lines from. (See photo below) You will turn the paper so it is on point. Decide which of these lines will be your vertical line. This will determine how the design of the card stock looks on your box. 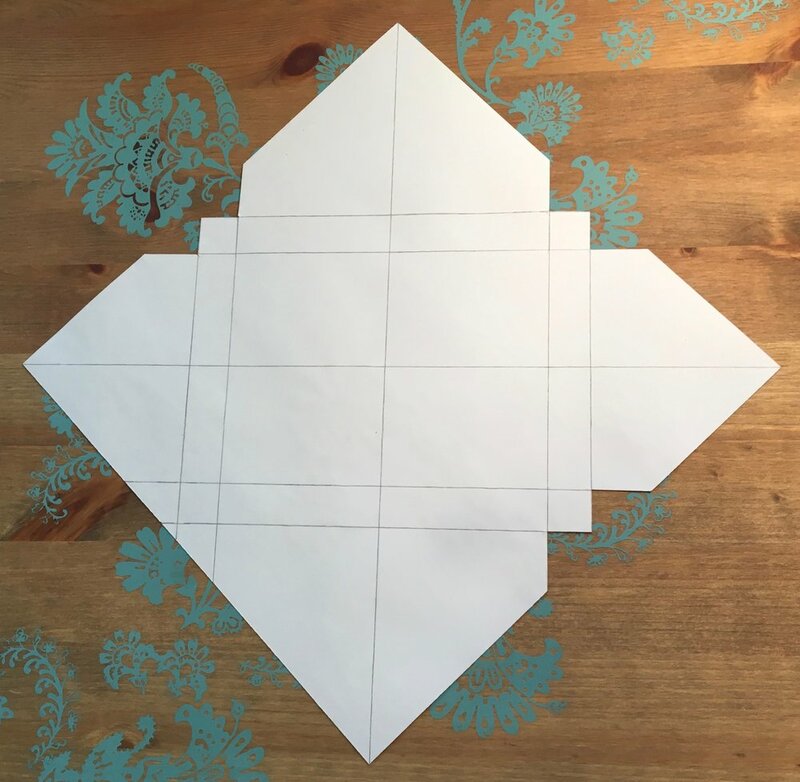 The design will be on the diagonal, but if the design on your paper is directional, you will want to consider this as you make the rest of the marks for your box. Now we need to cut along some of the lines. I have the lines that need to be cut highlighted in red in the photo below. You will want to pay attention to this closely as there are some cuts that you will make on the vertical lines, but you will not cut on the corresponding horizontal line. 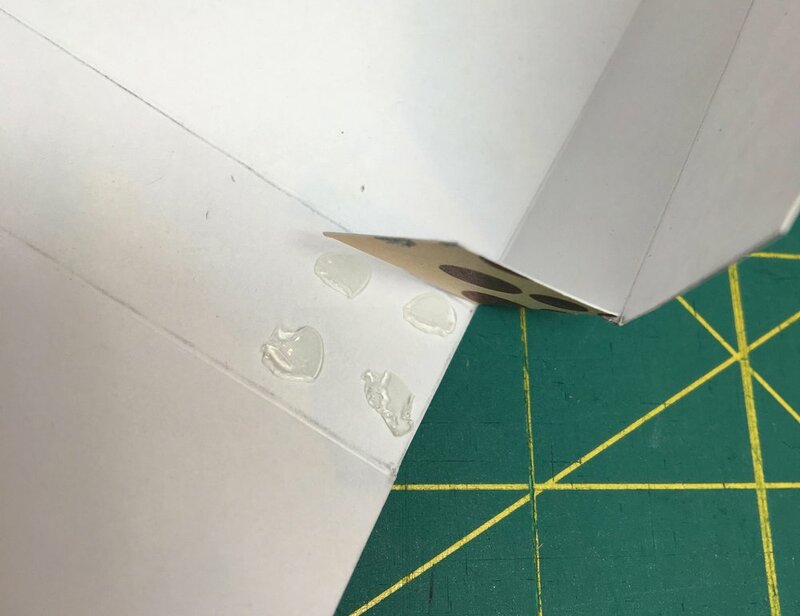 Done correctly, the cuts will make the tabs for gluing your gift box togethe. The photo on the left, below, shows how it looks once most of the cuts are made. The photo on the right below shows how the cuts make a tab for gluing. The remaining lines indicate where you will need to make folds. I find it is easier to score these lines first using a ruler and scoring tool. There are actually tools that are made for scoring paper and card stock, but I have found my favorite scoring tool is something that lives in my kitchen . . . a butter knife. Use the smooth, non-serrated edge of the knife to score your card stock. It is best to use a ruler or straight edge to make sure you get a good, straight fold line. 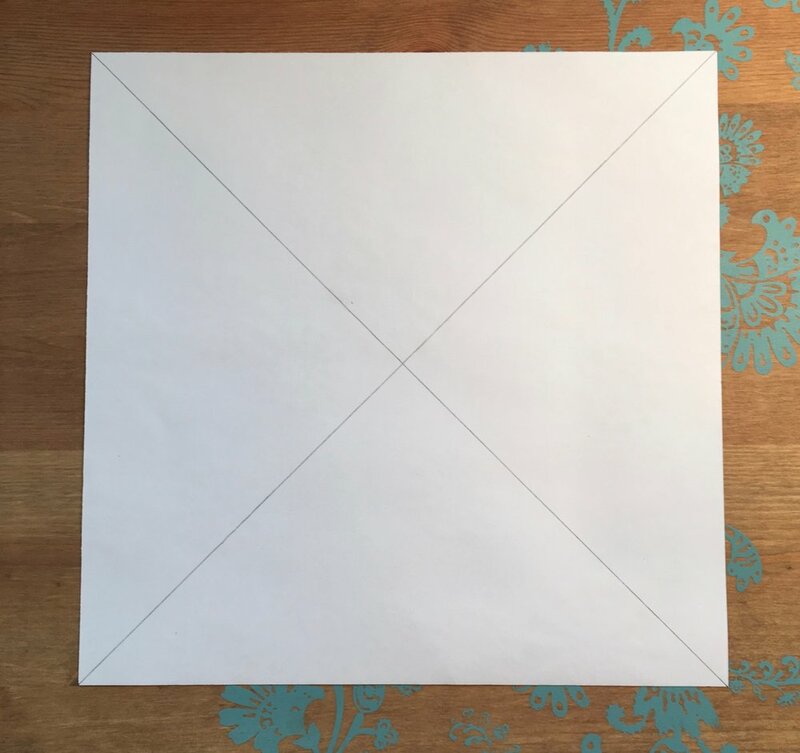 Just line up your ruler along each of your fold lines and pressing down firmly, draw the smooth side of your butter knife along the pencil line. (See photos below) Make sure you do not score the center lines - I like to erase the center lines at this point so that I don't forget and score them too! 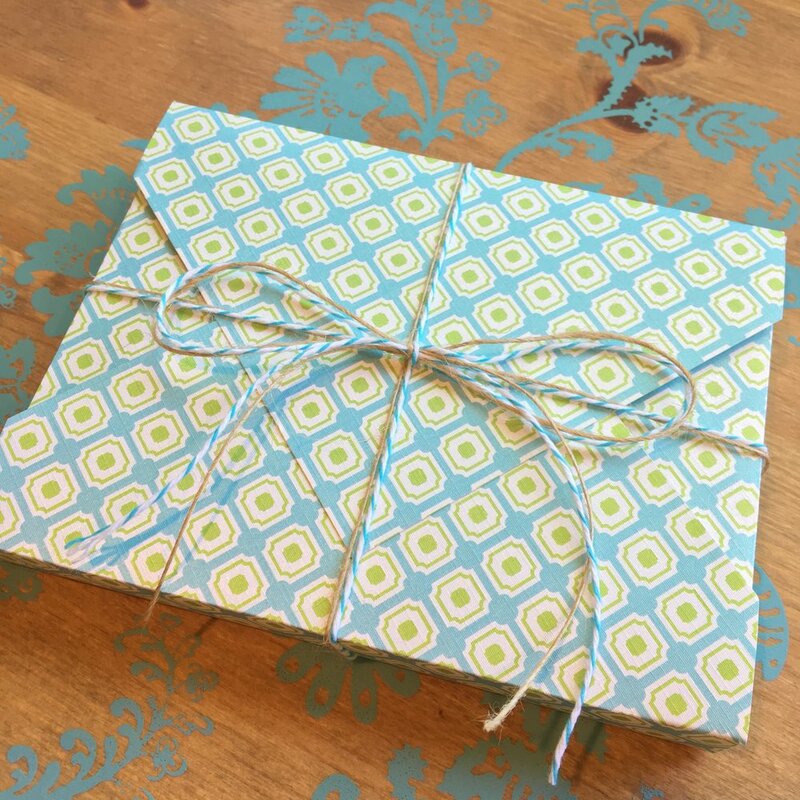 A coordinating sticker, a piece of Washi tape, or a glue dot work well to hold the final flap of the gift box closed. 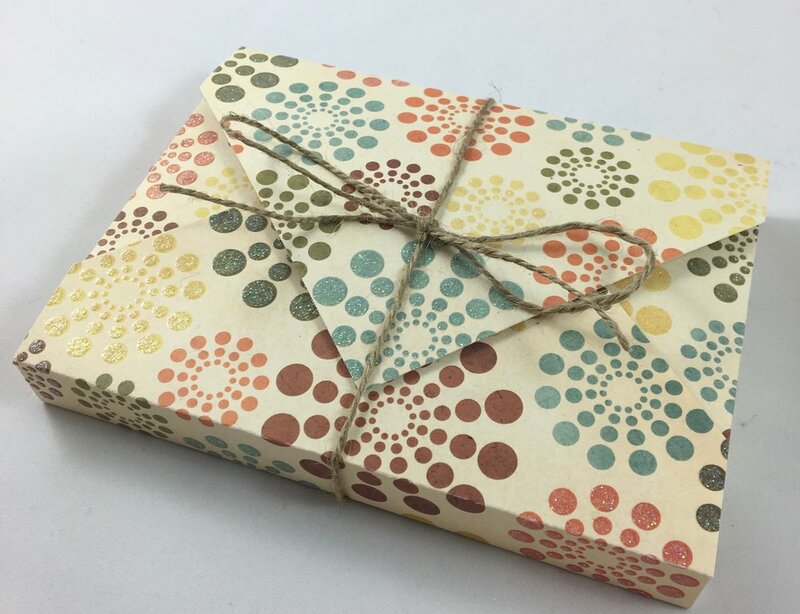 A ribbon or some twine wrapped around the gift box and tied with a bow will also work well to keep the gift box closed while making it look even more festive. For the gift I gave, I used both a Uniquely Michelle sticker and a couple pieces of twine to hold the gift box closed and to decorate it a bit - sometimes adding more is just more fun! In the photos below, you can see how I position everything in the box so that it fits well. Then as the recipient opens their pretty gift box, she sees the entire handcrafted-by-you-especially-for-her Kristine ID Wallet! 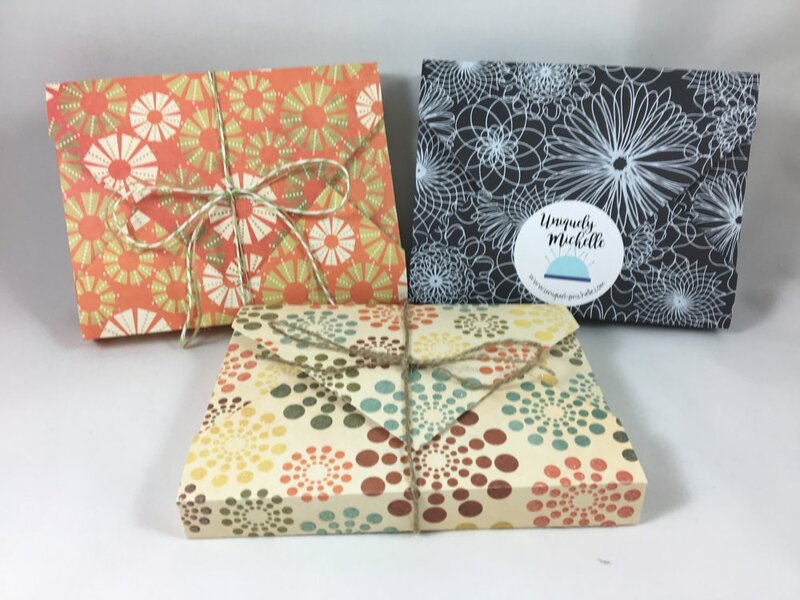 Having a few gift boxes available for sale at a craft fair, may help sales - someone may be buying a Kristine ID Wallet for themselves and then when they see the gift boxes, they may decide that they would love to gift a couple more wallets! Have fun making these gift boxes for your Kristine ID Wallets and have even more fun giving them as gifts! 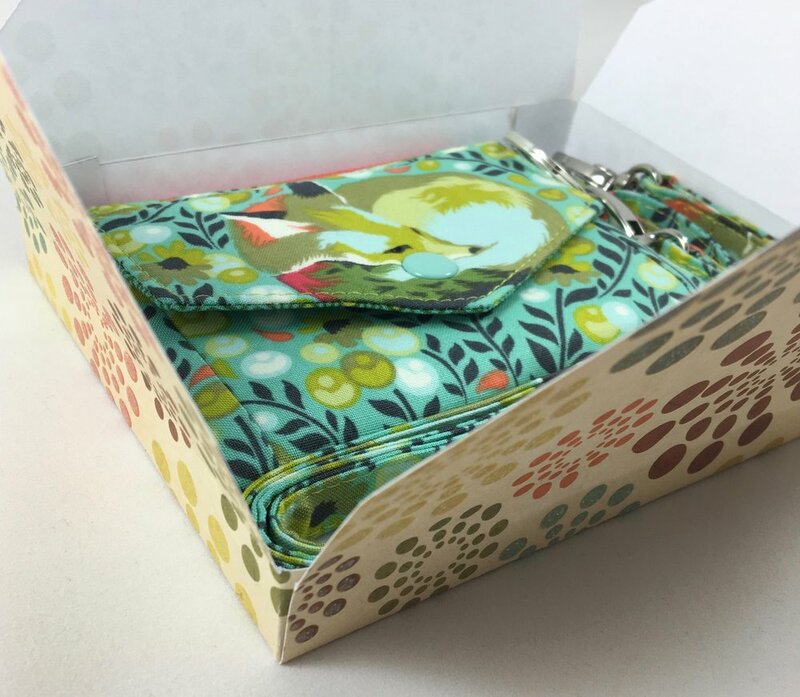 If you don't have the Kristine ID Wallet pattern, you can purchase it and all other Uniquely Michelle sewing patterns in the Uniquely Michelle website shop, the Uniquely Michelle Craftsy pattern shop or the Uniquely Michelle Etsy shop. 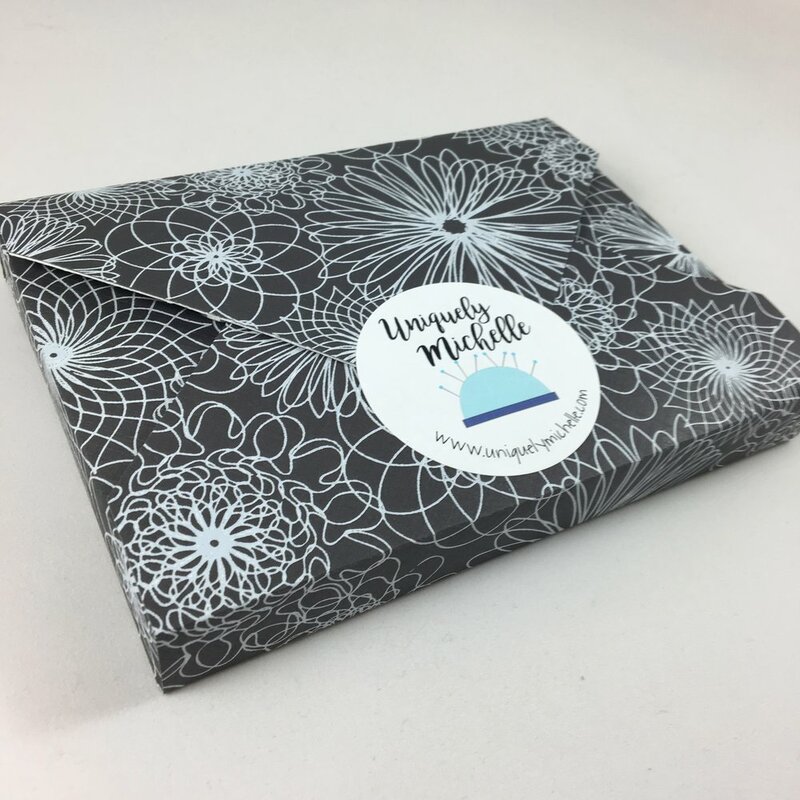 By providing your email address, we will keep you updated through email newsletters on events, promotions, sales and the latest happenings at Uniquely Michelle! We respect your privacy. You can change your mind at any time by clicking the unsubscribe link in the footer of any email you receive from us, or by contacting us at uniquelymichelle3@gmail.com. By opting in for emails, you agree to receive email newsletters from Uniquely Michelle that will inform you of sales, promotions, and the latest news from Uniquely Michelle. 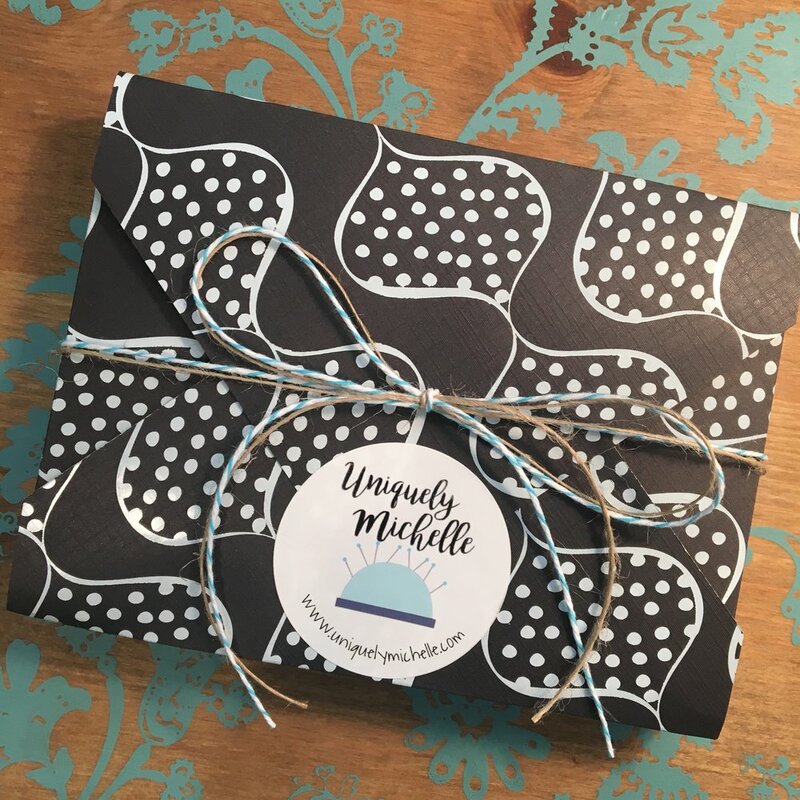 Uniquely Michelle Newsletters will be delivered to your mailbox about once every 10 days unless there is a special event going on in which you may receive a newsletter once a day, but only for about 1 week. We will never sell or give your email to a third party. By submitting your email address, you agree that we may process your information in accordance with these terms.